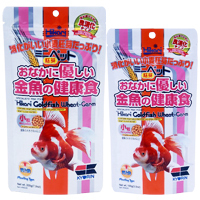 An easily assimilated, highly digestible daily diet for adult goldfish, baby koi and larger tropical fish. The high wheat-germ content (over 40% by weight) makes this diet rich in natural vitamin E and linolenic acid, an easily digested, high quality protein source for both koi and goldfish. Highly digestible even in colder water temperatures which allows your fish to take full advantage of the nutrition within while reducing their waste output. Helps the skin develop beautiful luster with a glossy finish. Rich in stabilized vitamin C which promotes resistance to stress and immunity to infectious disease. A floating pellet which allows you to easily monitor and adjust the amount of food fed to avoid over-feeding and never clouds your water.